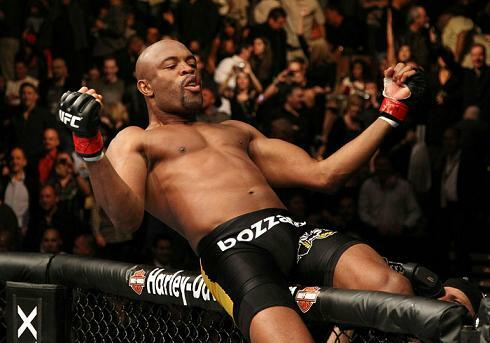 Anderson Silva is arguably the greatest fighter in the history of mixed martial arts. His gruesome injury at UFC 168 shut down the former UFC champion, but only temporarily. Photos of Silva in the gym have given us all hope that Silva will be back in the octagon much sooner than we originally thought. So who should “The Spider” fight when he comes back? Silva’s manager Ed Soares appeared on The MMA Hour to discuss that very topic. Not surprisingly, the guy who never seems to go away is one of the top options for Silva’s comeback. That would be quite a spectacle indeed. Diaz claims to be retired, yet he is constantly reminding us that he’ll come back for the right fight (and the right money). Even though a title wouldn’t be on the line, this would certainly be the right fight. One thing fans can gather listening to Soares is that Silva doesn’t plan to rush back by demanding a title shot—or even a top contender—immediately. That’s probably wise. The other names mentioned by Soares—Michael Bisping and Cung Le—seem to indicate that they are more looking for someone Silva can dominate, but still brings some name recognition that can be used to headline an event. Diaz, Bisping and Le all have value when it comes to public perception. They are all also badly overmatched compared to Silva. i mean Silva vs Le has a chance to be insanely exciting but I see it ending quickly for Le like it did for Belfort. Diaz could make it a war and I’m not sure Silva wants that for his first tune up fight. Bisping would get embarrassed, I see that one looking like Silva vs Griffin. You never know though everyone has seen that Silva has trouble when you take him down now. Much easier said than done.